Effective, great value, convenient. Focuses on what matters – passing your City & Guilds 2382-18 exam and getting you 18th Edition qualified. Over 1000 practice questions. 100% pass rate. Alexa audiostream lets you listen on the go. The best value, most effective 18th Edition Course available. Sign up and start the course immediately. No need to wait for availability. Study in your own time and when you are ready take the City & Guilds 2382-18 exam. You can choose to have Electacourse make your exam reservation at one of our partner centres or make your own exam arrangements with a certified exam centre. City & Guilds suggest the 18th Edition Course should take 35 study hours. We find that nearly all our customers will have completed the Wiring Regulations course in within two months of self-study. With thousands of successful 17th Edition customers and a pass rate of close to 100%, the Electacourse 18th Edition Course is the best way to get yourself 18th Edition qualified. As you study the course material you can practice your understanding by using the online 18th Edition Exam Practice on any internet connected mobile device. The Electacourse 18th Edition Course is designed to enable candidates to acquire the knowledge and skills to pass the City & Guilds 18th Edition exam. 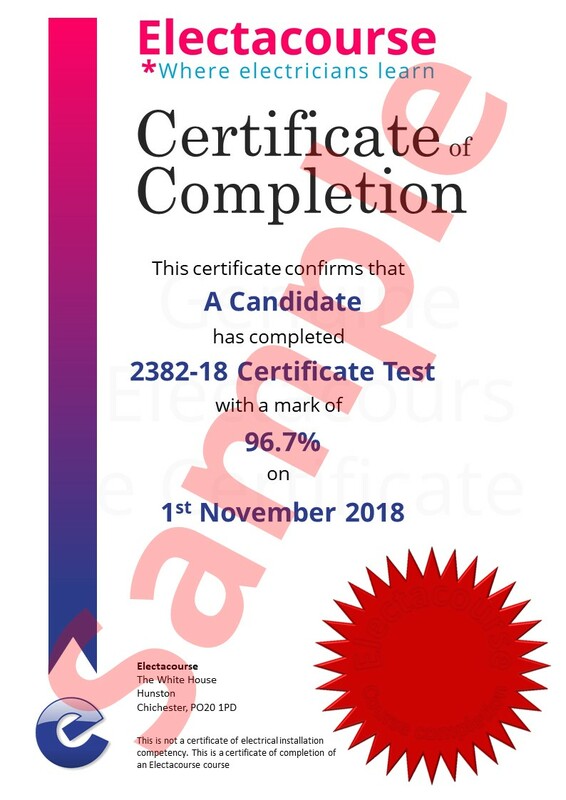 The exam is intended to not only test an electricians understanding of the Wiring Regulations, but also to test your ability to find your way around the BS7671 Wiring Regulations quickly and accurately. The focus of the 18th Edition Course is to help you do exactly this. Each lesson and topic concentrates on sections of the regulations which are most relevant and most often referred to. Throughout the course questions are designed to test your ability to use the Wiring Regulations so that when you come to the exam you can quickly find where in the Blue Book are the correct answers. No other 18th Edition publication offers this advantage. 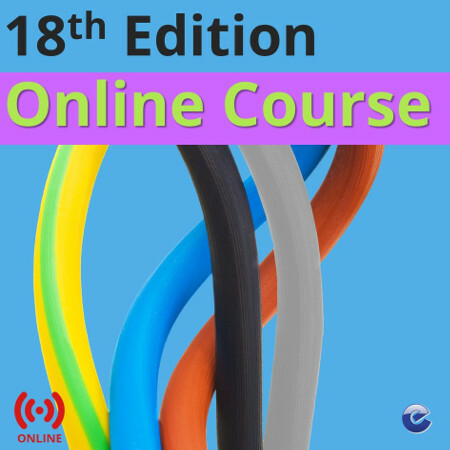 The 18th Edition Course is illustrated throughout and includes end of section questions and over 1,000 exam practice questions with answers including Wiring Regulations references. We have also teamed up with an experimental Amazon programme and are using their advanced text to voice computing power to provide audiostreams at key points in the course. In July 2018 IET have updated BS7671 Wiring Regulations to the 18th Edition and from January 2019 all new electrical installations have to conform to the 18th Edition. 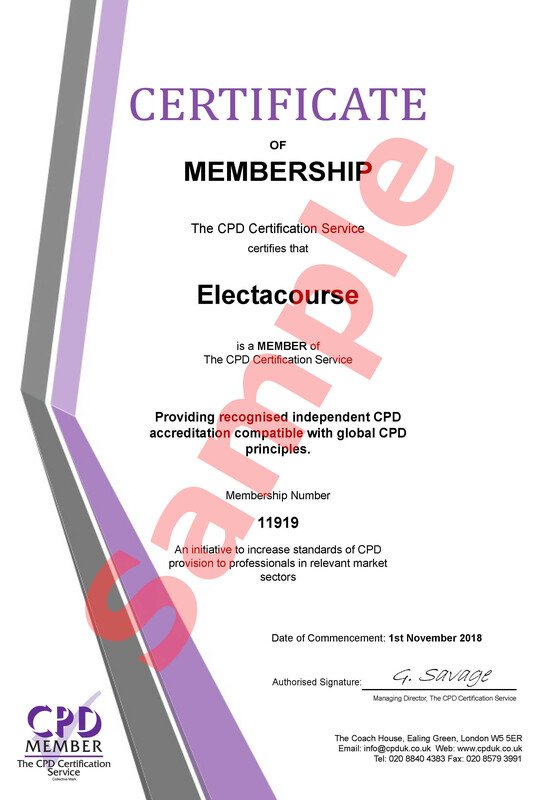 The Electacourse 18th Edition Course is intended for any electrician who needs to become 18th Edition qualified and wants to do it in the most efficient way possible. In practice every electrician planning to work in the UK needs to be 18th Edition qualified. You could be a student at college or an experienced electrician updating your qualification from previous editions of the Wiring Regulations. Maybe you have been working for a while and now need the 18th Edition Qualification to get your next job. Perhaps you are making a career change to become an electrician or you are an electrician from overseas wanting to work in the UK. Fully up to date to the 18th Edition of the Regulations. Many new illustrations, many new question. I found it really good and very cost effective. This course has many advantages over traditional courses – Firstly it’s cheaper, secondly you choose when you can work on the course, thirdly you can spend as long as you want on sections that are more challenging and finally the exam practice is very useful. 100% recommended! Robert. Thanks for a great review. What you have written: we couldn’t have put it better! Policela. Thank you for a great review. We are glad the material was helpful for you. I used your courses back in 07 when you started. They were highly graphic, with minimal words & lots of cartoons pics & photos. Being next best to the real world, that really stuck in my mind. Richard. Thanks for your feedback and for being a loyal customer. You are right we have cut back on the images and cartoons. We did this in response to customer feedback. Overwhelmingly people told they come to us because they want an efficient way of getting through the 2382 exam, and are not looking for more comprehensive electrical training – which is available in many places. Accordingly, we have concentrated on detailing those parts of the Regs which are most likely to be the subject of exam questions, lots of questions and exam techniques. We know the course is now rather dry, but then so are the Regs. Would be better if add test questions for the Appendices. Generally, very good platform, easy to navigate, and the practice test breakdown is invaluable in helping you see which parts need more attention. Ben. Thanks for your comment. We are going to add some questions into the Appendix lesson. There lots of Appendix questions in the complete practice test. Hope all your colleagues do as equally well in the exam as you have done. Good way to learn navigation of textbook. If the Regulations are updated, as they are during the course, it would be nice to send people the update. The course does enable a person to get to know where to find information that they need to know. In this the course is first rate. However, the test invariably will have questions, that even if you do EIGHT of the final exam question, will have questions you will of not anticipated. This is where familiarity with the regulation book will come into its own. Anyway I could not of done it without your course. How I approached the course was to print out the course so I could read it at my leasure. I then did an exam to see my starting point. Read each chapter up to the end of Chapter 4. Did each test again, printed out the questions and answers. Reviewed what I got wrong. Then moved on to Chapters 5 On Ward in the same way. Then I started from the being again. After this I then did about the 18th Edition practice exam, printing question and answers, using these as reviews. It is this repetition of the final exam, which enables a person to know their way around the regulations. Denis. Thanks for the review. Well done with your exam pass. Although we know we cannot reproduce every possible question City & Guilds might show in the exam, we are confident the large majority of our questions are similiar to C&G questions. But perhaps more importantly our questions give our customers good training in how to find their way around the Regs book – which is the essential requirement for the 2382-18 exam. Shiva. Thanks for the great review. Feedback like this is really appreciated. It gives us and our all our customers, confidence. Hi Roberto. We haven’t included practice tests after sections 2 (Definitions) and 6 (Inspection and Testing because both these sections are so short. There are not so many questions which authors can write to test these simple sections. In the full practice and certificate exams at the end of the course, these sections have questions relating to them – as with all sections. hi you have streamlined the course since i studied the 17th edition with you. you explained fundamentals more which made it one of the best courses i studied. it depends what you want are you an experienced electricain looking for the for just enough to get through,or an electrical course which explains 18th edition. obviously the practise tests are a massive strength, if they represent the exam as well as you did in 17th. i would listen to the feedback over time see what people say. Will. Thanks for your review and your comment about how we explain fundmentals and which makes it one of the best courses you have studied. We get it that it is important to understand the Regs and electrical installation practice, but we also know how important it is to be well prepared and ready to pass the exams. We can see in the backend you are doing great with the course and we are sure you will do well in the exam. Six months after the launch of the 18th Edition, we have not had a single candidate fail the exam. Most are passing with really high marks. We like to think this reflects the quality of our course. Touch wood, this continues. Thank you for another good course and I’m pleased to say I passed with 91.67%. Happy with how the course was laid out. I found navigating the course (on CD/DVD) confusing at first in comparison to the 17th Edition course i did with yourselves but after a while i found it works well being more concise and effective. Excellent. I think everything is well explained. It is time saving regarding the flexibility. Any comments we can use to inform others about the course? – I found the course gave me time to study my regs at my own pace and in my own time. Thanks for the helpful feedback. So far our priority has been to invest heavily in the questions practice. In what we see of how our customer study, it is practice, practice and more practice which leads to exam success. But it is in our plans to add more photos and drawings. Feedback wise from speaking to the guys during the course everything was positive, the online course was good and the ‘motivational’ emails from yourself gave us a kick to get on with it! Overall the online course was well structured and easy to work through and it did what is was supposed to because we all passed so I think the results speak for themselves. Overall a great experience and we will be recommending it to everyone. The online course was well structured and informative. The exams at the end of the chapters were very helpful. I would not hesitate recommending Electacourse for online training. Fitting in time to study around work was really helpful. Far better than tying up time at college. Does the job. Liked the unlimited exam practice. Passed.